It’s not quite fall here in Albuquerque but the leaves are starting to change and along with a chill in the morning air football is just around the corner. I wouldn’t say that my family is comprised of football fanatics but we do all enjoy the game, the men enjoy the sport and the women enjoy the cooking, hosting and entertaining side of it. Prior to the season starting we hosted a Monday night fantasy football draft party at our house. 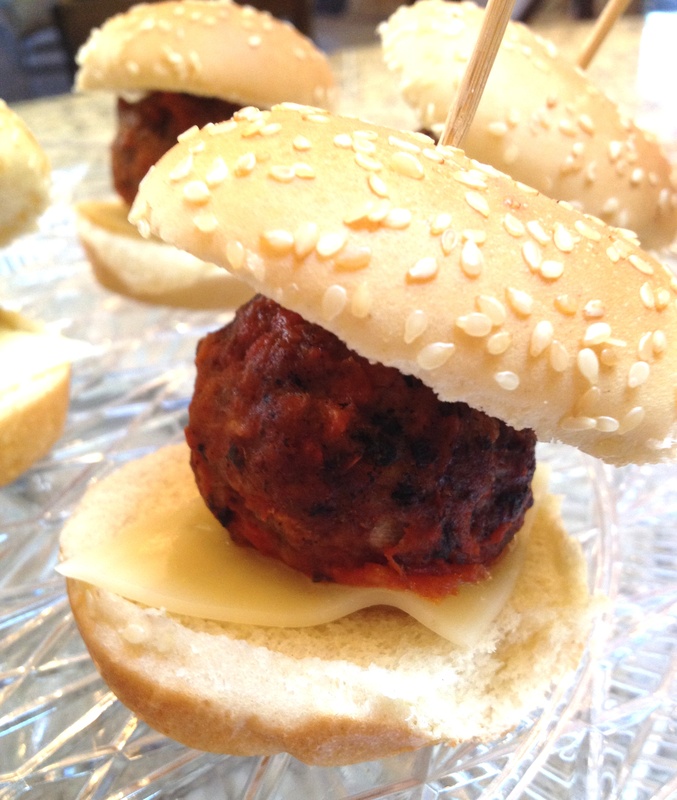 Among the many different game time foods served were these BBQ Meatball Sliders. I came up with the idea after my neighbor HH and I spent a few hours one morning making a large batch of meatballs to freeze. I thought the meatballs would be fun to serve but I wasn’t sure just how I wanted to do it until I was roaming through Trader Joe’s and picked up a few packages of these mini hamburger buns. Perfect! I thought. Meatball sliders. I didn’t want the sliders to be dry so I coated them with tomato sauce and added some provolone cheese. When the big draft day came these babies were the first thing to go. These Sliders will be perfect for you to make when while hosting your next game day get together. Prep: In a large bowl, using your hands, mix the ground beef, onions and garlic. Once combined add the beaten eggs, milk and tomato sauce and continue to mix well. Finally, add in the dried bread, bread crumbs and all the dried ingredients. Roll out the meatballs in about 1 inch diameters and place in grilling basket, I would suggest using the Williams Sonoma Meatball Grill Basket which you can purchase below. Grill until golden brown and crispy on the outside, about 15 minutes. Enjoy right away, serve with your favorite sauce or make into a Meatball Slider using some tomato sauce, cheese and a mini hamburger bun, I buy mine at our local Trader Joe’s Grocery Store. You can also cool and freeze for later use. notes: I also like using jalapenos or red chilli flakes in my meatballs for added flavor and kick.